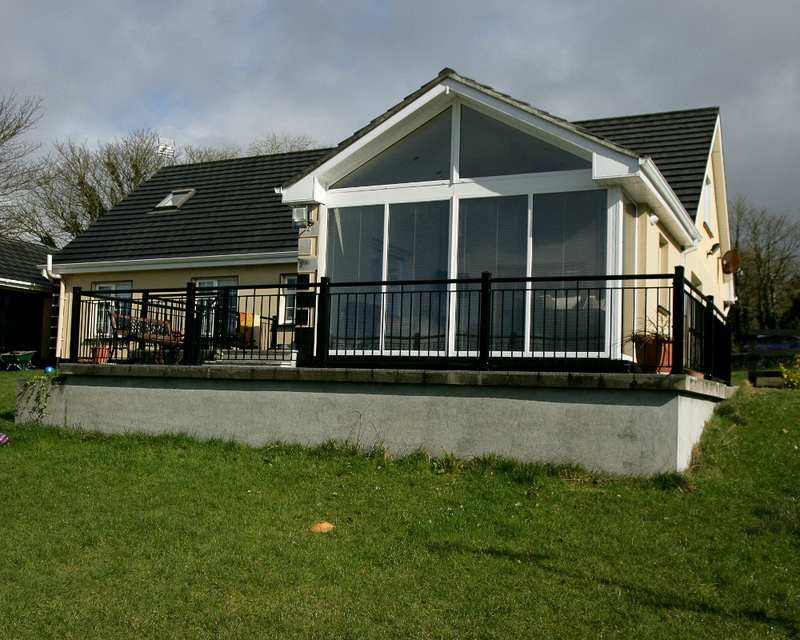 BUNGALOW EXTENSION & PATIO | Mathieu & Mitchell Ltd.
Gary and Bernie Feeney contacted Mathieu & Mitchell about building an extension and patio to the rear of their dormer bungalow. 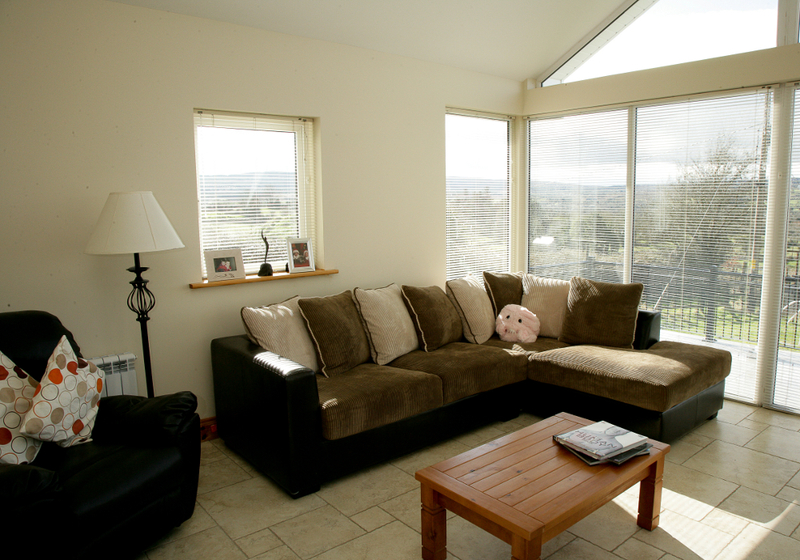 Laurik Mathieu was quickly able to create a 3D image, which gave them a clear picture of a well designed, affordable, energy efficient, light filled space, which maximized solar gain whilst also capturing the beautiful views of the Slieve Aughty Mountains to the west. 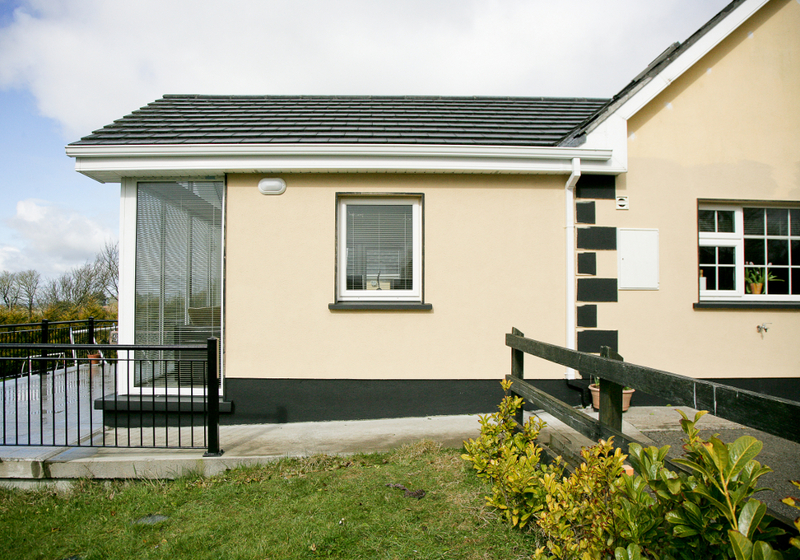 Under Galway County Council guidelines this project was exempt from planning because it was less than 40 sq meters and to the rear of the house. 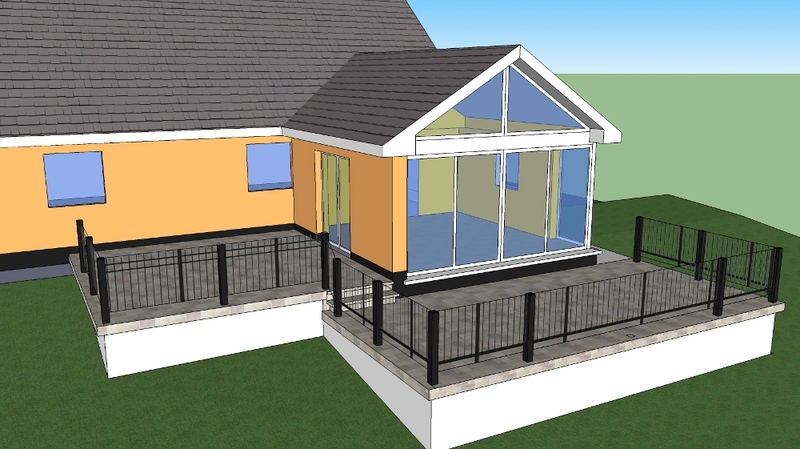 The agreed design was a 25 sq meter room with a vaulted ceiling, glazed gable, French doors opening out onto a split level granite patio surrounded by a black powder coated railing. 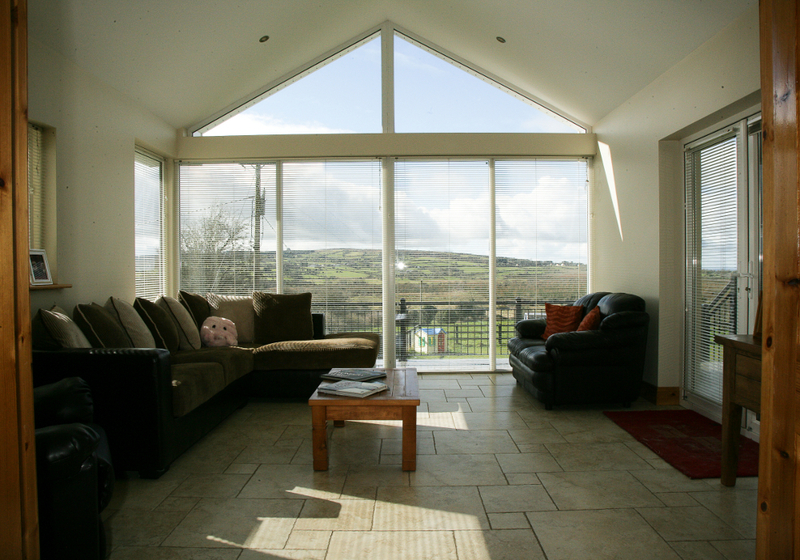 A-rated windows and doors, an air tightness package and highly insulated walls, roof and floor ensured that this warm, light filled space could be enjoyed all year round. A quick turnaround time was critical as the work needed to be completed before the summer holidays. A steel structure set in a raft foundation with concrete block infill was the agreed method of construction. This meant that our carpenters were able to work on the roof while the bricklayers were building the walls. Another crucial element of the project was that the energy efficient windows and doors were designed, manufactured and delivered to our warehouse before the work commenced. This saved us at least three weeks but was only made possible by detailed consultation with the client followed by accurate execution of the work by our excellent bricklayers. 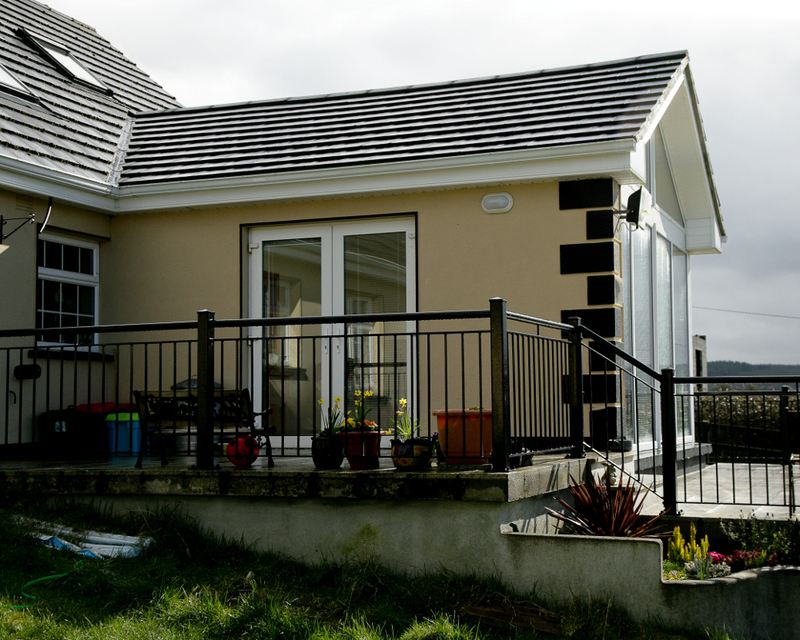 Following the completion of the extension we set about the construction of the patio. Thirty-millimeter granite slabs were laid on a reinforced concrete slab using the solid bed method and a high quality external tile adhesive, which reduces the risk of frost lifting the slabs during the winter months. 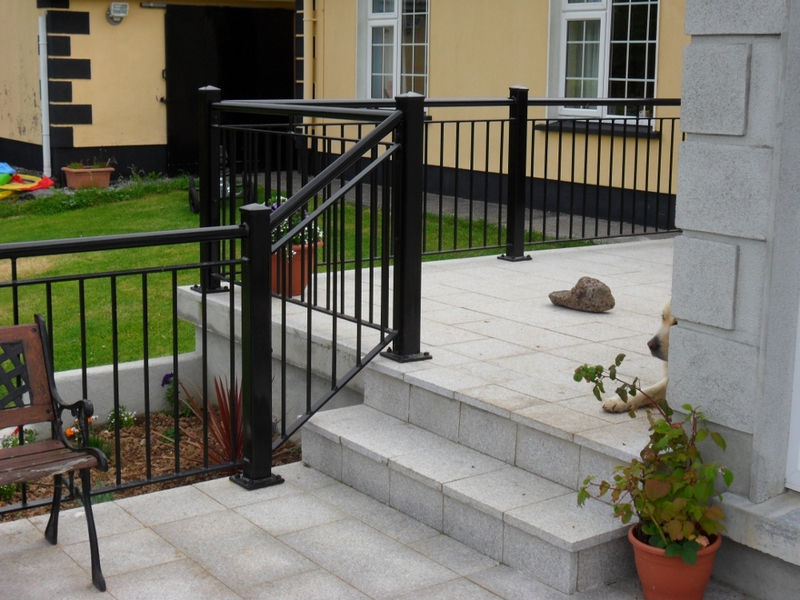 The black powder coated railing was fixed through the paving stone and into the concrete slab using approved anchor bolts set in Hilti chemical anchor. All work was completed on time and within budget. 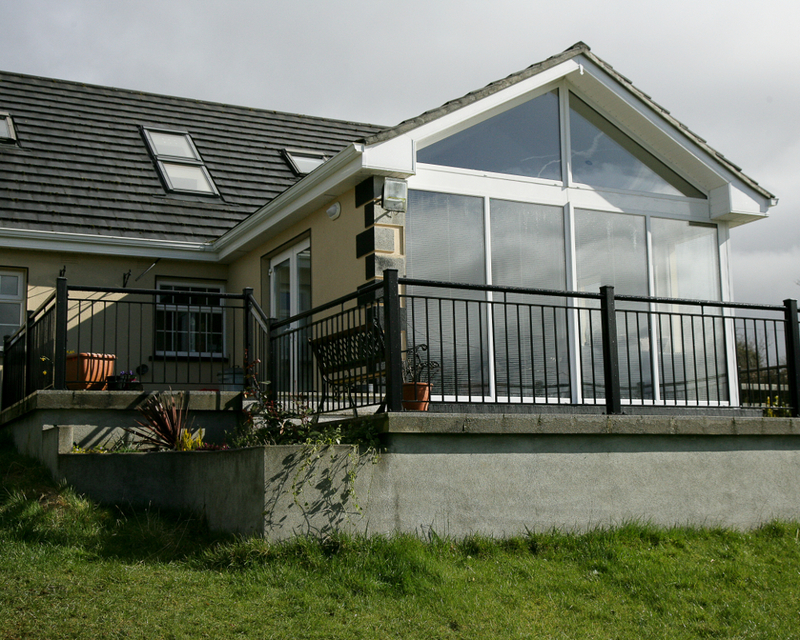 The final result was a practical, energy efficient, low maintenance extension leading on to a suntrap patio. The owners were surprised and happy to find that the existing house is noticeably warmer and costs less to heat because the new extension acts as a kind of high performance buffer against the prevailing winds. It took nine weeks to complete the project from start to finish including design.